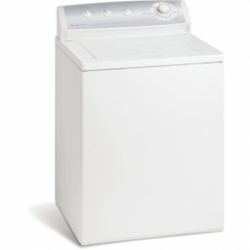 The FTW3011KW is a top-loading washer that comes with a number of useful features in a simple design. It has various spin speed cycles, automatic temp control, and and extra rinse option for a more powerful performance. Read on to see what it has to offer. It has a no-frills design for those who are looking for a straightforward machine that can handle normal laundry tasks. It comes with 2 agitate and 3 spin speed cycles to give the fabrics a thorough clean. The self-cleaning lint filter screens the lint and prevents buildup lint on the filter. The Titan 25 Polypropylene Wash Tub is strong enough to withstand heavy loads. The Advanced Rinse Technology uses a fresh batch of water for a fresher rinse and to remove traces of detergent and soap. Automatic temperature control feature allows the washer to determine the temperature when it mixes hot and cold water together to get the right temperature for the load. Bleach and fabric softener dispensers are available for added convenience. The sound package feature reduces the level of noise in the machine. The extra rinse option allows you to give the load another rinse. The style is compact, perfect for small laundry rooms. The 4 temperature options allows you to choose the safest temperature for your garments to avoid shrinking fabrics. Its 3.0 cu. feet capacity makes the unit perfect for a medium-sized home. The classic white color gives the unit a stylish look. It comes with reversible door for easy loading and unloading. One of the best things about this unit is that it is compact, very easy to set up, and very easy to use. The features are basic, but the cleaning power is superb. No need to confuse yourself with hard-to-understand controls and complicated settings. You can choose a setting with one touch of a button, from any of the washing cycles to the timed settings according to how long you want to spin the clothes. The compact design allows you to put the unit in small, tight spaces. One of the main disadvantages is the tub, which is not as durable as a stainless steel tub. The plastic tub cannot withstand very fast speed cycles, and results in warping and breaking when used for faster speed cycles for most of the time. The description given here is from a manual that is written for all similar models but it does not have all these features that are listed in the manual. I downloaded manual as I was to ill to shop and the salesman quoted the manual butthis model does not have these features. Customer Support also uses the manual and says well your washer might not have these features. 1. The lid won't open. I waited over 10 minutes and had to pound on it. 2. You cannot fill with lid opened. You cannot see agitation or spin speeds. 3. the agitator and softener receptiacle come off. I found a way to override the lid lock and ran a delicate cycle and the agitation and speed are the same as the normal cycle which is good on jeans but not delicates. Water level isn't high enough. Can reset higher with wash but rinse will not be high enough. I suspect many owners had their delicates damaged and don't realize the problem with the agitator and spin speeds. This unit should be recalled.